The purpose of the American Red Cross Lifeguarding course is to provide entry-level lifeguard participants with the knowledge and skills to prevent, recognize and respond to aquatic emergencies and to provide care for breathing and cardiac emergencies, injuries and sudden illness until emergency medical services (EMS) personnel take over. Participants must be at least 15 years of age and be able to pass the pre-requisites for the course. The pre-requisites for the course are: swim 300 yards continuously; swim 20 yards dive down 7-10 feet and retreive a 10 pound brick, return to the surface, swim 20 yards on the your back in 1 minute 40 seconds; and tread water with no hands for 2 minutes. There are review course options available for this certification if you are currently an American Red Cross certified Lifeguard. Upon successful completion of this course, Instructors will be able to identify components of the YMCA Swim Lesson continuum, demonstrate the behaviors of an effective YMCA Swim Lessons Instructor, maintain an inclusive environment of learning while keeping order in a positive and safae enviornment, employ swim teaching techniques that breakdown the critical feature of a swimmer's skill progression at any age and stage and demonstrate the swim instructor's role in teh safety process and during an emergency. The purpose of the American Red Cross Water Safety Instructor course is to train instructor candidates to teach courses and presentation in the American Red Cross Swimming and Water Safety program by developing their understanding of how to use the course materials, how to conduct training sessions, and how to evaluate participants' progress. Participants must be at least 16 years of age and be able to pass the pre-requisites for the course. The pre-requisites are to perform the following at a level 4 swimming ability: 25 yards front crawl, 25 yards back crawl, 25 yards sidestroke, 25 yards elementary backstroke, 15 yards butterfly, tread water for 1 minute, and float on back for 1 minute. The purpose of the American Red Cross Basic Life Support for Healthcare Providers course is to ensure that indviduals with a duty to respond (public safety professionals and healthcare providers) have the requisite knowledge and skills to respond to patients who are experiencing respiratory and cardiac arrest and airway obstruction. The emphasis is on providing high-quality care integrating psychomotor skills with the skills of critical thinking and problem solving to achieve the best possible patient outcomes. The purpose of the American Red Cross Lifeguard Instructor is to train instructor candidates to teach courses and presentation in the American Red Cross Lifeguarding, CPR/AED, and First Aid program by developing their understanding of how to use the course materials, how to conduct lectures, discussions, skills, skill scenarios, and skill drills. Participants must be at last 17 years of age and be able to pass the pre-requisites. Contact Kelly Winkels at kelly.winkels@prescottymca.org if interested in taking this course. The purpose of the American Red Cross Junior Lifeguard course is designed to teach students basic water rescues, now to help lifeguards. In the class students will become Junior Lifeguard certified, CPR, and First Aid certified. Students must be at least 11 years of age and be able to pass the pre-requisites. Contact Kelly Winkels at kelly.winkels@prescottymca.org if interested in taking this course or register at the front desk today! 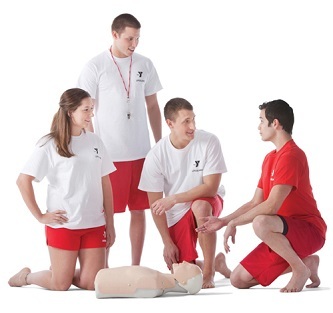 Every month the James Family Prescott YMCA offers ASHI CPR and First Aid. Class times and days vary. Basic Life Support classes also offered. Inform the instructor prior to the start of class that you need BLS and be prepared to work a little longer.